Over the course of the next two days we focused on re-organising the camper and tried to eliminate as much of the excess weight as possible. This camper is pretty large and heavy for the truck and we feel virtually every kilogram of weight while we're travelling - so it's worth it to spend some time lightening the load. Anything we didn't necessarily need in the camper, we placed outside on the picnic table in our site. Occasionally we'd sit outside with a cuppa for a rest to enjoy the scenery and of course the peace and quiet of the park. At one point, while we were discussing how to pack a certain item into the bag in front of us - we noticed some movement from behind us and each of us swung around to see what it was. Usually we're on the look out for visitors to our campsites (especially bears) and almost expect it but this time we were so deep in conversation that it caught us completely off guard. 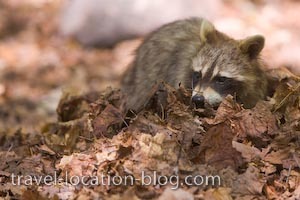 Easing his way onto the site - from right beside us was a Raccoon ... as proud as punch!! He was very cute although he was also a rebel. We retreated to the camper to watch him then the next thing we know he's up on the picnic table, scratching and biting at the bag we'd been packing. He obviously knew he was pushing his luck as he had one eye on us and was working very fast to open the bag - but he wasn't fast enough for us. With camera in hand, Rolf rushed out and the raccoon (which we later nicknamed Rocky Raccoon) made a quick dash for the cover of the forest. He still hung around though and instead of foraging at our site started looking into what snacks lay in the dry leaves of the forest floor. Rocky Raccoon visited us everyday while we were there - he'd just come slinking on to the site, climb the steps to the screen door of the camper and standing on his hind legs would peer in to check on us before moving on ... to the next site no doubt. Besides Rocky the Raccoon, we were frequently visited by the squirrels who were bold enough to stand up on the picnic table at eye level while we sat there. They wanted our cookies, we knew there was an ulterior motive but they were cute nonetheless - and no they didn't get a crumb of our cookies! So between the wildlife and scenery of Killarney Provincial Park we had a fabulous time there - it's such a beautiful place to visit. It's also an excellent place to spend some time in the canoe exploring the shoreline and forest (although our canoe never made it down off the roof of the camper).